The Aggies return one of the best dual-threat quarterbacks in the country in senior Chuckie Keeton, who earned first-team All-Western Athletic Conference honors as a sophomore, which can’t be ignored when looking over the college football odds page. Keeton ranked second nationally with 17 touchdown passes through five games as a junior before missing the final eight contests of the season with a knee injury. 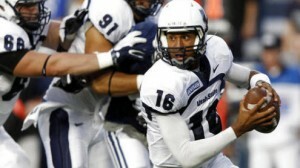 Utah State welcomes back three proven wide receivers in senior Ronald Butler, JoJo Natson and Brandon Swindall. Despite losing five players who started at least five games in Logan a year ago, the program does return a lot of talent and experience up front, including senior offensive tackle Kevin Whimpey who has started 26 straight games. College football handicappers will need to be aware that the Aggies will have to replace three letterwinners on the defensive line, but five players with significant experience do return—highlighted by end B.J. Larsen. Arguably its most talented position on the field, Utah State returns a plethora of skilled players at linebacker, including two who earned second-team All-Mountain West honors a year ago in Zach Vigil and Kyler Fackrell. Without a doubt, the biggest concern heading into its opener against Tennessee is the secondary, considering the squad will need to replace four starters that graduated, which is important to consider when making your NCAA football predictions. Starting off against a Southeastern Conference opponent is always difficult, but the Aggies will get a breather in taking on Idaho State the following week before welcoming in the Wake Forest Demon Deacons on Sept. 13. Utah State has a challenging schedule throughout the season, especially a pair of conference road games against the BYU Cougars and Boise State Broncos. It’s important to point out that the program is avoiding Fresno State and San Diego State from the West Region. The Aggies will go as far as Keeton can take them, which is a bit of a question mark due to the amount of time he missed a year ago. Keeton is a talented player, but he may struggle in the early going behind a youthful offensive line and the lack of experienced perimeter weapons.